Gov. Eliot Spitzer announced the formation yesterday of a state panel to develop strategies to allow all New Yorkers to get access to high-speed Internet service. The panel, the New York State Council for Universal Broadband, will recommend ways to extend high-speed access beyond traditional methods and to extend broadband connections to underserved rural and urban areas, the governor said. 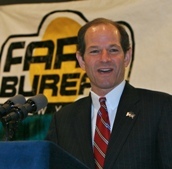 In his speech, Spitzer set targets: affordable universal access @ 20Mbps statewide, with 100Mbps in metro areas, by 2015.